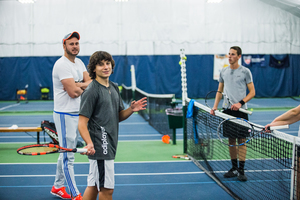 Our junior tennis programs help kids learn in an environment that focuses on camaraderie, self-esteem, physical fitness, discipline and good sportsmanship. They will develop just as many life skills as they will tennis skills. 10 & Under Tennis fits tennis to kids based on age and physical size. Any child can start playing tennis almost immediately, even if he or she has never picked up a racquet. To make it easier for them, we change the court sizes, racquet sizes, the balls, the scoring system and even the net height. Like other popular youth sports, 10 & Under Tennis stresses the importance of play and team competition. Juniors are placed according to age and ability from beginner to intermediate. Maximum 4 players per court.